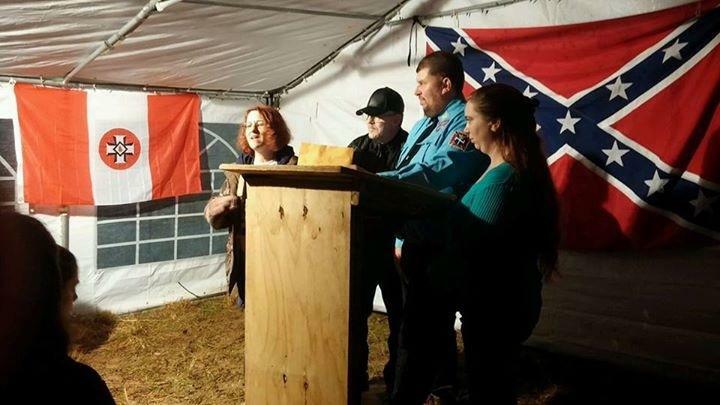 I got home from Mississippi last night from Christmas with the Klan, which was also a fund raiser put on for Gary Yarbrough. What I seen was amazing. 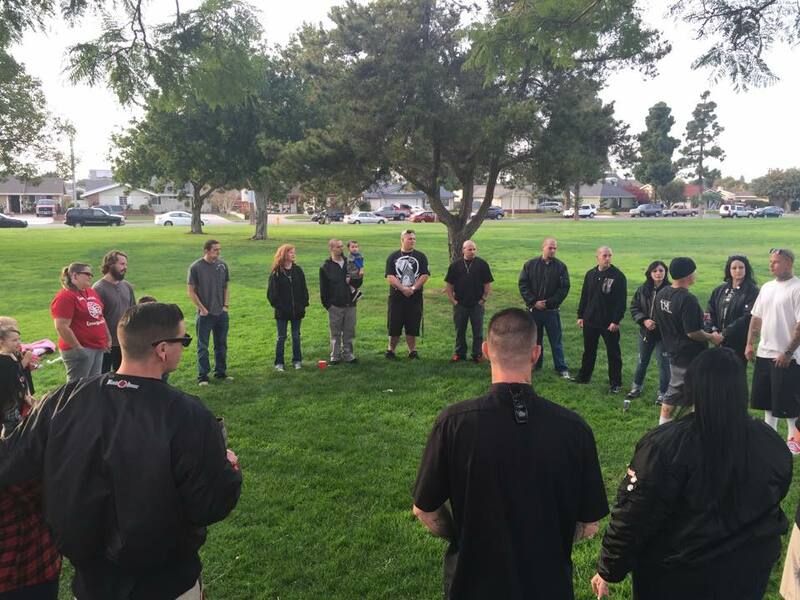 This was not just Aryan Nations Klan but also other Klans, who showed up for this open event. Despite the rain and the cold, many people showed up for this open event and we had a great time of fellowship and meeting new people. The speakers were excellent. One of the speakers, Shaun, noted about noticing a unity developing under Gary’s cause/situation. So many different groups from Europe to the United States are coming together for his cause….UNITY! But $1.106 was raised this weekend, and I had a great time in fellowship. I met some wonderful people! We are doing what our enemy fears the most…UNITY because if we stand together, we are stronger, and it makes our defeat impossible. If we can stand together in unity for Gary, we can also on other issues that affect our folk! Here is a picture of a group photo of those who purchased shirts this weekend. 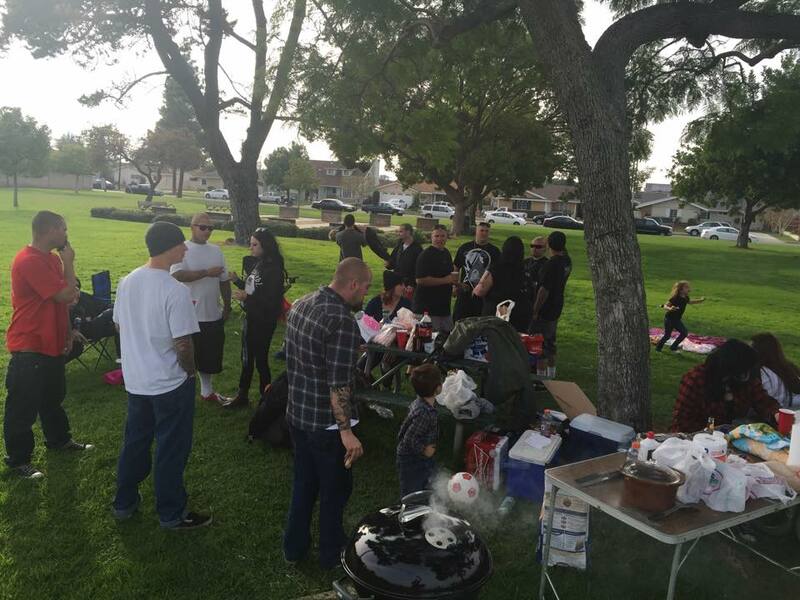 Thank you to Aryan Nations, Pastor Gulett, and Shaun for having this event! 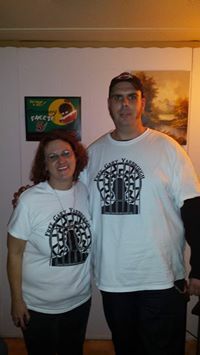 Gary Yarbrough not only needs financial support for his legal fund but also just plain ole support and encouragement. It is the holidays and he is still separated from his family and loved ones, and feeling sort of blue…this is normal. The world is passing him by while he watches. So, I want to give my husband encouragement. Could you please comment a few words of what he means to you and some encouragement, so I can write these words to him in a letter? You can also mail them to me at hillman1219@hotmail.com, if you don’t want them put publicly on here. Gary gave all for us, and he is needing a little bit of encouragement right now, so lets do this for him. Or you can write him yourself and tell him. Let’s keep his spirits up and let him know he is not forgotten. Just got off the phone with Gary, and he has been receiving the cards and letters! He told me to say thank you for all the support! It means so much to him! Keep them coming!!!!!!! His spirits sounded so much better! 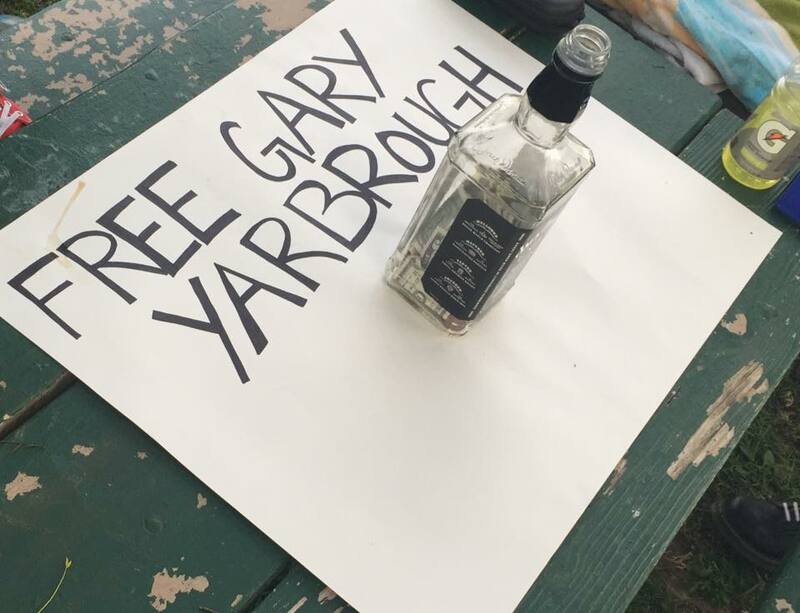 The support is continuing for Gary Yarbrough and his legal fund. More funds were raised in California tonight, and these wonderful people have given me permission to share their pictures. This is what we are really about…..love. The media only portrays the bad. We are about love and preserving our culture and heritage, just like other ethnic groups. We are not the evil, crazy monsters that the media portrays. Our events are family friendly and family oriented. Family is so important to us, just like everybody else! The media only portrays the “loose cannons” and the “attention-seeking” fools. We are truly about love of folk, and not hatred or violence. Here are the pictures from California and thank you all!!!! A special thank you from Gary and myself! With all of us working together…Europe and the United States, we will have the law firm hired and Gary on his way home!!!!! We are showing true unity and we will only get stronger! Various groups and individuals in the UK are coming together to do a demonstration at the U.S. Embassy in London. 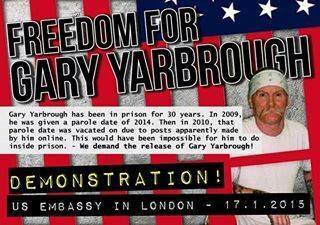 This event is being put on by United Nationalists Wow, the unity being shown in Europe is amazing, which goes to show that Europeans and Americans can work together to through various events to get Gary Yarbrough home 🙂 This demonstration at the U.S. Embassy will be on January 17th, 2015. If you live in the UK, you need to show up for this demonstration. You can contact Chris at chris1991fl@yahoo.co.uk for more information about the demonstration.